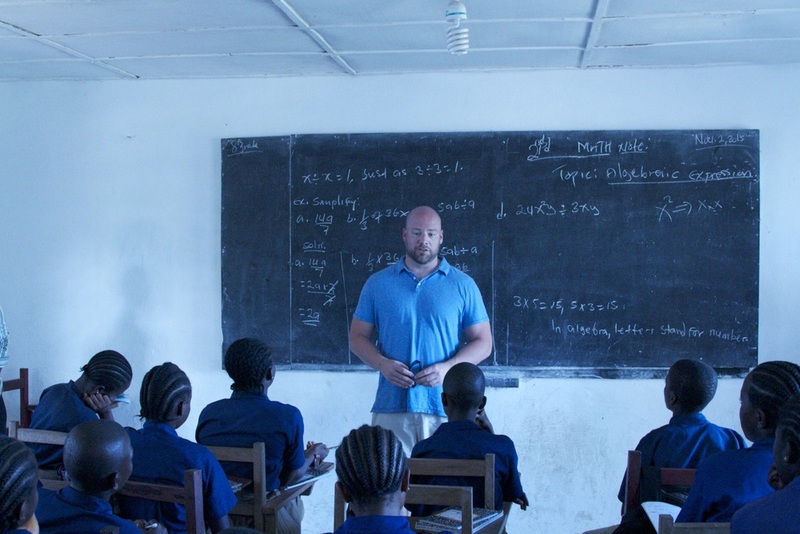 Indiana Teacher Todd Cannon Visit Liberia Nov 2015 — Change Agent Network, Inc. Essay by: Teacher Todd Cannon from Indiana USA on His Visit to Liberia in November, 2015. The road from the airport is dark. Human shadows line the road--their shapes briefly illuminated by headlights before disappearing into the darkness. Moving closer to the city, the shadows increase to reveal larger crowds congregating along intersections and open spaces. It’s after midnight and the throngs of people outside are unsettling, creepy. “What are these people doing, Eric? Just hanging out?” I am fascinated and confused by this late-night procession, and I can’t help thinking that this is some zombie apocalypse unfolding outside my window. “Yeah, all night...they hang out all night.” Eric turns to face me from the front seat and his silhouette is cut from oncoming headlights. “It’s like this every night. There’s nothing else for them to do.” The flickering of cell phones illuminates the emptiness and dots the landscape like fireflies. Distant spots of light begin to emerge from a few fortunate homes: a hazy glow powered by generators. We turn onto a narrow dirt road full of large, jagged rocks and axle-snapping craters. The driver navigates the road slowly, cautiously. The cell phone lights and hazy glows fade away, and the country is dark again. For over thirty minutes we are bounced and tossed in the SUV before we reach our destination. Finally, I see a lonely street light rising from the top of a hill. We have climbed out of the darkness and arrive at Heart of Grace School. Liberia has been climbing out of the darkness for over thirty years. After two successive civil wars in the 1990s and 2000s that claimed the lives of 250,000 and displaced over twice that many and an Ebola crisis in 2014-2015 that killed over 4,800, the country has struggled to secure anything that resembles a high quality of life for its citizens. With a middle class that is non-existent, an unemployment rate hovering around eighty-five percent, and a corruption index ranking at 94, Liberia has yet to find the recipe for success. “We call this road ‘Prove Your Love’,” Eric says. “Because anyone who travels this road must really love you to go through this.” Eric is Eric Wowoh, and he is the reason I came to Liberia. A former refugee, Eric is the founder and executive director of Change Agent Network (CAN), a non-profit from Dallas that builds schools and hope across Liberia. I met Eric six months ago when a determined and globally-conscious student convinced him to speak at Southwestern to bring awareness to her water-for-Africa program. Eric spoke with each one of my classes before addressing the entire student body at the end of the day. He recounted his fourteen years as a refugee before coming to the United States, his struggles to adapt to American culture, and his determination to build CAN and give back to his country. At the end of his visit, I told him I wanted to go to Liberia to start a sister school partnership with Southwestern. It wasn’t until after I arrived in Liberia that he told me he had doubts about my resolve: “I knew you less than a day, and you were already committing yourself to Liberia,” he said. “I believed you were sincere, but I didn’t think it would happen.” I had doubts too. Since the Ebola crisis, flights to Liberia had been extremely expensive. Family and friends expressed concerns about Ebola and the stability of the country. Additionally, I wasn’t sure if it was feasible to save enough money, leave my wife and kids, and gain the support of my administrators and school board. Luckily, all the tumblers clicked into place, and I arrived in Monrovia, Liberia, on October 30 for a week-long stay. In the early morning just after sunrise, children are pulled toward the school from all directions as if by some magnetic force. It is not yet time for class to begin. The children are there to collect water. Before the purification system was installed in 2013, they walked a quarter mile down a rugged hill to collect water from an untreated well. The current system allows students to spend less time hauling water and more time in class. I stand next to the water source as numerous children fill heavy buckets, heave them on top of their heads, and teeter away. Later, Eric takes me on a walking tour along red dirt roads that crisscross and connect homes, markets, churches, and schools. It doesn’t take me long to realize that Eric Wowoh is a local celebrity. Residents, young and old, approach us with wide smiles and outstretched hands to welcome their hometown hero back in the folds of the community after his extended absence. Students pay approximately fifty cents a day to attend school. The collecting of daily tuition seems to be a system that works since most families in the neighborhood would find it impossible to pay for an entire semester upfront. I understand. “This is Africa,” I muse. At 8:30am I greet some of the same students who were collecting water and selling cooking oil not an hour earlier as they now arrive for school in neatly-pressed uniforms. After addressing the entire student body, I visit each class individually to explain my mission: “While I’m here I would like for you to be my teacher. I’m here to learn from you. I want to take your stories back to my students in Indiana, and I hope we can be friends for a long time.” As is the case with any school I’ve ever visited, it is the older students who are most reticent and suspicious. Conversely, the younger students are curious, wide-eyed, and open. They gather around me excitedly, touching, poking, and rubbing my white skin. They hold my hands in theirs, turning my hands over and over, tracing my palm lines before examining their own. Little do they know that as they examine and rub my skin, their hospitality, perseverance and optimism are rubbing off on me. Each school I visit has fewer resources than the last, but they still maintain the same passion for education. There is a general sense among those I visit that the burden of their environment is an obstacle they must overcome themselves: They have waited too long in the darkness to rely solely on the government. How unusual it is for us to claim responsibility for problems that we inherit. How refreshing to see education valued and respected in the midst of poverty and corruption. Indeed, I have learned lessons from Liberia. In the end the partnership that I had envisioned between Southwestern and Heart of Grace does not seem possible at this time. A lack of resources and technology prevents us from communicating and collaborating in a timely and efficient manner. However, my goal of spreading awareness and empathy is not lost. I will keep my promise to those Liberian students, and I will share their stories in my own classroom. There is much to learn and benefit from listening to stories. On my last day, we drive back to the airport at dusk; the country is enveloped in a dusty-orange glow. Again, the streets are lined with people ambling in opposite directions: a woman sauntering with a laundry basket of greens balanced on her head; a young man with a sturdy countenance walking determinedly; a small group of teenagers hailing motorbike taxis. Closer to the airport there is a larger-than-normal crowd gathered on either side of the road. Some spectators are peering around nervously, but the majority are otherwise subdued. As we slow down, the driver points out the body of a young male on the ground lying face up. “A car done killed somebody,” he says as we drive by.